Staying at a manor house can be so much more fulfilling than staying in an impersonal hotel. Read on to find out why. The chapel at the side of the Casa do Outeiro had been empty for decades, perhaps even centuries; it was not even worth looking at - or so at least we were told on our first visit. 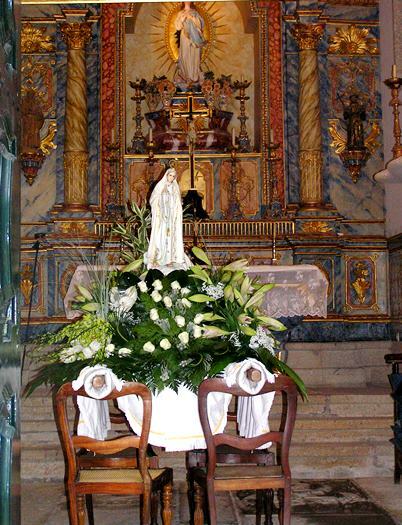 Then, a few years ago, Dom João heard that a nearby church was being deconsecrated so he negotiated a deal, bought the entire contents and furnished the chapel as an anniversary present for his wife, Dona Ana. Have a peep at it with me as Our Lady is being prepared for her festival. So appropriate are the furnishings that you would think they had been there for ever, wouldn't you? 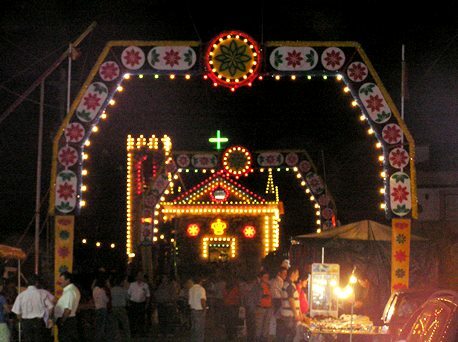 One of our visits to the house coincided with the Festival of Nossa Senhora da Luz, Our Lady of Light. No sooner had we arrived than Dona Ana rushed to tell us the news. "Today we are decorating the house with lights. The village priest is coming in the evening to collect the image of Our Lady and take it to the church to be re-dedicated. We'll follow it and hear mass". She had a sudden thought. "But of course you're protestant, aren't you? That hadn't occurred to me. Never mind, you can come with us all the same, can't you? Mind you, you won't have time after the service to go to a restaurant in town so you must come and have dinner with us. Lots of the family are here. We'll be more than 20 round the table." It then materialised that we weren't the only ones to be missing the service. "It's a holiday for the cook so while we women go to church, the men will be making dinner. They'll make lots so there'll be plenty of food to go round. You will come, won't you?" Of course; we'd just love to come, wouldn't you? The decorations were simple but lovely. 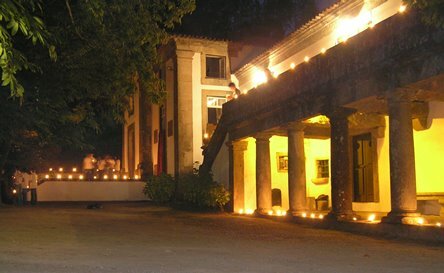 Little oil lamps glowed along the balustrade and down the stone steps of the main entrance. The villagers, who came to follow the procession, carried candles. We followed the procession down to the village, where decorations, lights and market stalls had been set up and people were ready to party after the service. When we got back to the Casa do Outeiro we found that not only had the men made a superb paella but the cook had left a huge pan of soup to be reheated. Don't let anyone tell you Portuguese men can't cook. They can. They may prefer to avoid it but when push comes to shove.....! The paella was scrumptious. It was the conversation that made my day, though. There are insignificant anecdotes which somehow bring a family to life. 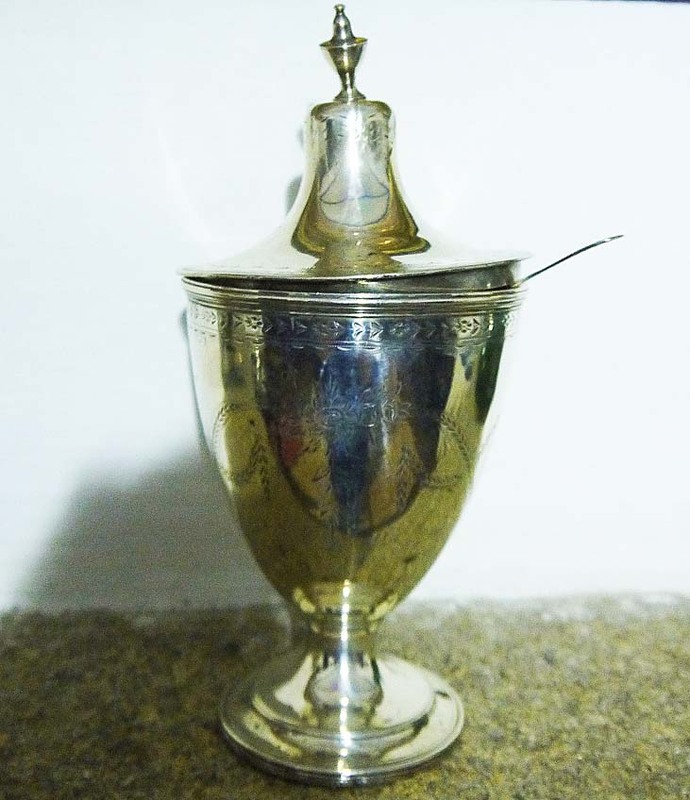 Over coffee, Dom João opened up a silver sugar bowl, which I had seen many times before. 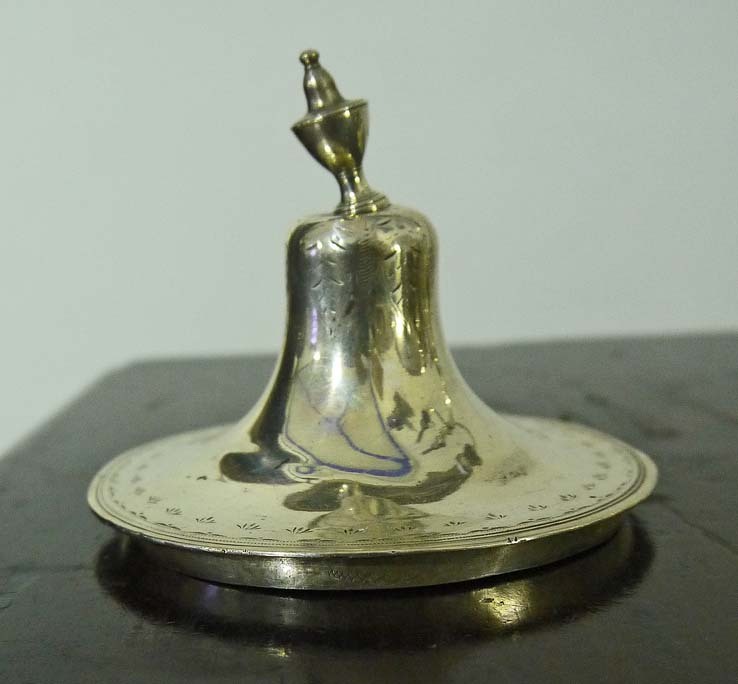 It had a crooked finial on the lid. This took Dom João straight back to his childhood. "I first remember visiting this house when I was 8. My great Aunt Filomena and her two unmarried sisters lived here then," said Dom João. "One day," he went on, "I picked up this sugar bowl and saw that the finial was bent. I tried to straighten it and was roundly reprimanded. 'Don't do that!' they said, 'You'll break it if you try to bend it back.' I'm 86 now and I've been looking at that bent finial for 78 years. I wonder if I'll ever see it straightened before I die." As far as I know that finial is just as crooked as ever. I think it will always be. Then we got to talking about Portuguese family names, which can be incredibly long. "Ah Madame, Madame," said the Lencastre nephew, "we must not fight." He went on down on one knee, kissed my hand and presented me with a flower ... from a vase on the table. It wasn't a rose but then roses were thin on the ground at the time. And thus in the 21st century a renewal of the Wars of the Roses was narrowly averted on the Festival of Our Lady of Light in the Casa do Outeiro, manor house of the village of Arcozelo on the fringe of Ponte de Lima. I'm Portuguese, born and raised, and I want to tell you how lovely this blog is! I truly deeply love Portugal, I just couldn't love it more and everytime someone shares this love of mine I feel like we're almost friends. I'm only 22 so my memories of a happy not poor country are all about my childhool. When I was a little girl and everything seemed fine, my family and I used to travel every sunday or holiday and our will was always to discover some new portuguese hidden Paradise. And we did. Everytime. However, as I was just a child, I don't remember that much and that well of what I've visited. But I do remember Serra da Estrela and it will always remain in my heart. I just found out about your blog so I don't know if you have already mentioned this, but every Spring in some parts of the country you can see the "amendoeiras em flor", mainly in the north I guess - where I'm from - and it's so beautiful that almost looks like a miracle! Over a decade ago we used to go every year to BraganÃ§a to spend the day surrounded by those trees and its beautiful flowers. I remember the colours, all white and pink, I have memories of the sweetest smell... Hope to be able to come back some day. So... here you have more about the portuguese beauties, in case you haven't heard about it yet. One of my dreams is to one day pick up a van and dive in my country to discover everything I can and then settle somewhere. No doubt it will be somewhere the north, which is already my home. Thank you for your wonderful comments. I really enjoyed reading them and I'm so pleased you feel that they portray your country accurately. I have seen the almond trees in flower. It was down in the Algarve long ago when the Algarve was just a cluster of tiny villages and acres of orchards. How different it was then! I have been to Braganca, too, as well as the Natural Park of Montesinho just north of the city. Up there on the border, did you ever visit the village of Rio de Onor which is half in Spain and half in Portugal? One day I'll get back there and write about it for you. As you already know, my husband and I have a long connection with Portugal and love to be there. We are interested in everything, whether it is places to stay or crafts - I plan to research azulejos when I can - or archaeology - Briteiros is on my list as are the glyphs at Foz Coa - or food.... I hope will keep coming back to see what has caught my attention. Why don't you sign up to the news letter and then I can alert you to new posts as I add them. I do hope your dream of hiring a van and travelling around Portugal comes true soon. Indeed, I hope you can, perhaps, go back from wherever you are living now and contribute to the economy. A young person with such language skills should be an asset to Portugal but I do know how hard it is to find work. Good luck and do keep visiting the blog. I look forward to more comments.